The Trosky Baseball brand is a national brand which trains athletes in an efficient and unique way. Nate Trosky has developed a presence in the Midwest and has shared his insight with coaches who are expanding his model. Nate Trosky WILL NOT be present at this event, but the model and message will follow his plan. In addition the college coaches will bring a unique perspective from the programs they come from. 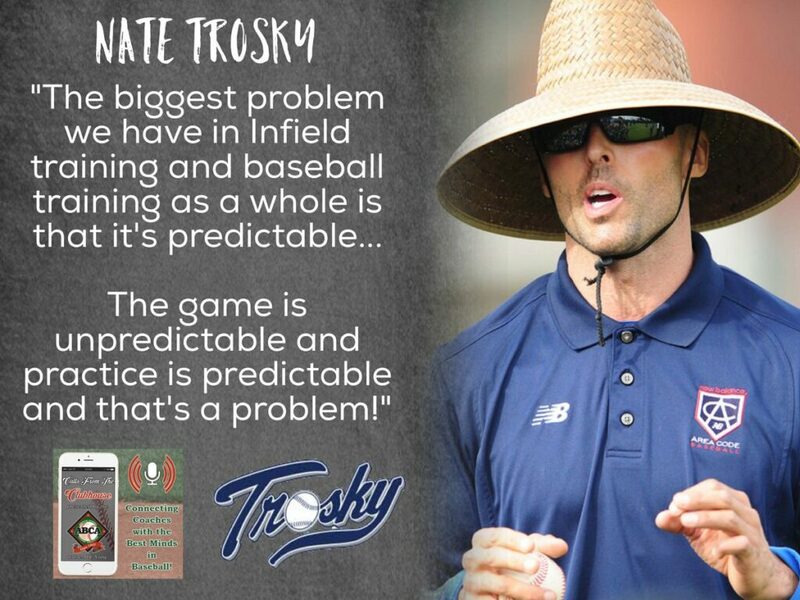 With nearly 25 years of running camps and working at major showcase events, Trosky Baseball has developed the most productive baseball camps in the country. Parents and players say Trosky camps exceed expectations. Camp participants will have the opportunity to learn the mental game and improve their skill set in a multifaceted training camp. These camps are built on the platform of Nate Trosky however he will not be in attendance. Each player must bring his own baseball equipment. Players should bring a glove, bat, batting gloves, helmet, running shoes or turf shoes, hat, and any other equipment they feel necessary. Trosky Baseball will not be responsible for lost items. 450+ College Commitments since 2011 Trosky Travel Teams. (3) first-round selections and (21) Top 5 round selections. Once payment is received, there are no refunds. All camps will be held rain or shine! Waiver of Liability, ReleaseFor and in consideration of the undersigned participants registration with Trosky Baseball (Organization) and being allowed to participate in events and member activities, participant and the parent(s) or legal guardian(s) of participant waive, release and relinquish any and all claims for liability and cause(s) of action, including for personal injury, property damage or wrongful death occurring to participant or participants parent(s) or legal guardian(s) arising out of participation in events, or sports, and/or activities incidental thereto, whenever or however they occur and for such period said activities may continue, and by this agreement any such claims, rights, and causes of action that participant and/or participants parent(s) or legal guardian(s) may have are hereby waived, released and relinquished, and participant and participants parent(s)/guardian(s) do so on behalf of their heirs, executors, administrators and assigns.Participant and participants parent(s)/guardian(s) acknowledge, understand and assume all risks relating to events or sports participation and activities incidental thereto, and understand that activities incidental thereto involve risks to participants and participants parent(s)/guardian(s) person including bodily injury, partial or total disability, paralysis and death, and damages which may arise there from and that we have full knowledge of said risks. These risks and dangers may be caused by the negligence of the participant, participants parent(s)/guardian(s)or the negligence of others, including the organization, its affiliates, members, event hosts, other participants, other parents and legal guardians, coaches, officials, sponsors, advertisers, owners and operators of the premises used to conduct any event and each of them, their officers, directors, agents and employees (collectively, releasees), and include risks arising from the conditions and use of facilities and related premises. I/We further acknowledge that there may be risks and dangers not known to us or not reasonably foreseeable at this time.Participant and participants parent(s)/guardian(s) acknowledge, understand and assume the risks, if any, arising from the conditions and use of facilities and related premises, whether as a participant or a spectator, including without limitation, the risks involved with participating in the Organizations activies. Participant and participants parent(s)/guardian(s) further acknowledge and understand that included within the scope of this waiver and release is any cause of action (including any cause of action based on negligence) arising from the performance, or failure to perform, maintenance, inspection, supervision or control of said areas and for the failure to warn of dangerous conditions existing at said facilities, for negligent selection of certain releasees, or negligent supervision or instruction by releasees.Participant and participants parent(s)/guardian(s) acknowledge, understand The Organization reserves the right to photograph facilities, activities and program participants for potential future use. All photos remain the property of the Organization and may be used for publicity and promotional services. Participant and participants parent(s)/guardian(s) further grant Trosky Baseball permission to contact them electronically or via mail with information about other news, events, services, products, and/or sponsor promotions unless I unsubscribe from its marketing list.Consent to Medical Treatment of Minor: I hereby give my consent to have the above applicant treated by a physician or surgeon in case of sudden illness or injury while participating in the above event. It is understood that the Organization provides no medical insurance for such treatment under its liability insurance coverage. Medical benefits for such treatments/injuries may be provided with proof of medical coverage purchased through the Organization. The location of the activity or the nature of the illness or injury may require the use of emergency medical personnel.Participant and participants parent(s)/guardian(s) agree if any claim for personal injury or wrongful death is commenced against releasees, he/she shall defend, indemnify and save harmless from any and all claims or causes of action by whomever or wherever made or presented for his/her personal injuries, property damage or wrongful death.Participant and participants parent(s)/guardian(s) acknowledge that they have been provided and have read the above paragraphs and have not relied upon any representations of releasees, that they are fully advised of the potential dangers and risks and understand these waivers and releases are necessary to allow the activities of the Organization to exist in its present form.I understand that travel insurance is not included with this trip and I understand that Trosky Baseball, its affiliates, travel agents and/or agencies are not responsible for any loss I may incur. I may purchase travel insurance through a third-party provider and understand that Trosky Baseball, its affiliates, travel agents and/or agencies are not responsible for any loss not covered by any policy I may purchase.By checking Yes, I consent below, I certify that I am the participant or parent/guardian of participant (if under 18 years of age) and agree to the terms above. I acknowledge that this electronic submission is legally binding and carries the full weight and intent as that of my written signature. All efforts will be made to contact me before procedures are performed.